I think I have a soap fetish. I get all hot and bothered over new fruity hand soaps and unique body washes. I'm tending towards OCD as I wash my hands often, just so I can smell the soapy scent afterwards. My soap-worship isn't just for my phalanges in the sink. In the shower, I use a 2-soap starting rotation. Most of the time I use a masculine body wash--generally Axe. (I hope that it will drive my wife to flock to my scent--it doesn't work) I also have a bar soap for days when I need a down and dirty scrubbing. Until recently, our household had been a Lever 2000 family. It has a faint scent, and rates a "medium" on the suds scale. I liked it, but am always up for something new. 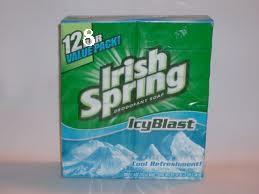 I decided to throw a curve ball on my recent trip to Costco, and bought a 128-pack of Icy Blast Irish Spring bar soap. You remember Irish Spring right? Terrible commercials from the 80's. Who's even been to an actual Irish Spring? Bad-toothed guys singing and swimming around? Who knows? Anyhow, I've put this soap to use over the past couple weeks, and it has strong points and weak points. It's very strong smelling. If you don't like the scent, beware--it takes over your entire bathroom. As it is, the Icy Blast smells better than the original Irish Spring scent to me. Thumbs up. It lathers very well. It garners a "high" rating on the suds scale. I like to suds my entire body up and then run around my house like a rotund white Muppet. Unfortunately, the suds start sliding down in the first couple minutes. Thumbs up for me--Thumbs down for everyone else. If you leave it near standing water in the shower, you'll turn the bar into a pile of mush. While all bar soaps have this problem, Irish Spring seems to be worse. Thumbs down. If you still use bar soap, I would consider this a must-try in your cleanliness arsenal. It's a strong scent, and anything that can mask or clean away fat-man stench is a positive in my eyes. Plus, if you buy in the Costco Mega-pack, each bar runs less than 50 cents. 4 squeaky clean stars!